Complete fertilizers are those that contain all three of the primary nutrients. Nitrogen, phosphorus in the form of phosphoric acid, and potassium in the form of potash. Every state requires that the percentages of these three elements be prominently displayed on every bag of fertilizer. The first number is nitrogen, the second is phosphorus, and the third is potassium. And example is 24-4–8. Remember to always spread fertilizer evenly. Avoid heavy applications or concentrated applications. This is particularly important if you are using soluble fast release fertilizers which can easily burn your lawn in heavy concentrations. These numbers state the percentages by weight of nutrients in the bag compared to the total contents of the bag. The percentages are called the analysis or the formula grade. A 3-1-2 ratio of nutrients has proven to be generally good for fertilizing home lawns. However, factors such as local climate, soil conditions, and the form of nitrogen in the fertilizer influence what is best in various locations. A fertilizer with a 3-1-2 ratio could, for example, have a formula of 21 – 7– 14. Although it is not critical for a fertilizer to have exactly this ratio, something close to it is recommended. A higher nitrogen ratio of six – one –two is common. For proper application follow the directions on the label. Some complete fertilizers or manufactured for general use. 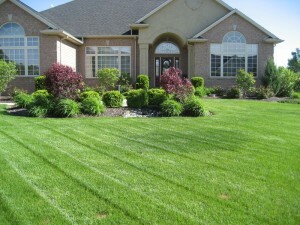 While other fertilizers are designed to be used on specific grass. A high percentage of water insoluble nitrogen means that a fertilizer is less likely to burn the lawn after application. But fertilizers with more than 30% of insoluble nitrogen are basically slow release. Between 15% and 30% are medium acting. Any less than 15% are considered fast acting fertilizers. As a result gardeners prefer Slow release fertilizers They avoid lawn burn after application. Use fast release fertilizers to hasten green up of lawns. In order to determine the actual percentage of water insoluble nitrogen. It is necessary to do a little arithmetic. For example, if you have a 25-3-7 formula fertilizer with 7.6% of water insoluble nitrogen, multiply the 7.6 by 100 which equals 760. Divide the 760 by the total percentage of nitrogen shown on the bag. In this case, dividing 760 by. 25 equals 30.4%. This 30.4% of the nitrogen is water insoluble. This example would mean that you’re fertilizer is at the high end of medium acting fertilizer. Heavy concentration’s might cause some burning of your lawn. Always use a spreader to apply fertilizer to your lawn. Spread lightly and use several applications that crisscross your lawn. Instructions on the fertilizer bag will help to ensure that consumers avoid any chance of burning their lawns. Slow release fertilizer combines the characteristics of the organics and the soluble synthetics your lawn needs. Usually this type of fertilizer has a high percentage of nitrogen. Spreading large quantities of fertilizer is not necessary for healthy lawn growth. Slow release fertilizer delivers nitrogen slowly to the lawn. As a result nitrogen does not become available to the plant all at once. Fast release nitrogen can burn a lawn if spread too thickly. Most importantly ometimes a heavy dose of fertilizer can even kill the lawn. This is one of the reasons that many gardeners use a slow release fertilizer. They avoid any chance of damage to the lawn. They also use spreaders that deliver fertilizer evenly and over a wide area. As a result this avoids concentrations of too much fertilizer in one area. Several types of fertilizer are available. WIN which means water insoluble nitrogen. Many commonly available lawn fertilizers are actually a combination of soluble nitrogen and WIN. Whether you water the lawn immediately or wait until it rains, there is no danger of lawn burn. The fertilizer is insoluble and will not release quickly. Many lawn growers prefer slow release fertilizers. They make heavier applications of nitrogen possible. Hence making fewer applications necessary. However, they do not provide a quick green up of the lawn. Your control of greening response is slightly more than with organics. Use a fast release fertilizer to green up your lawn quickly. However, extreme care needs to be taken to avoid lawn burn. The fertilizer should be spread less heavily and carefully. The John Deere JS36 lawn mower is a great lawn mower that will meet the needs of most consumers. This John Deere lawn mower js36 review is based on information and comments we have found available online. It comes with a 190 CC four cycle Briggs and Stratton engine. This engine is the work horse of many small engine machines and has a strong reputation. Easy starting is incorporated with a chokeless system. No priming or application of a choke. It does it for you. Safety is a prime concern at John Deere. When you release the control lever, the engine stops immediately. 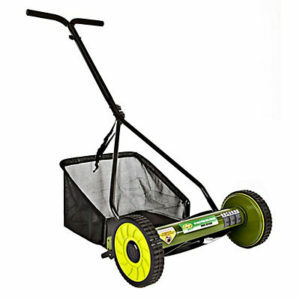 It comes with a 22 inch deck and a 3 in 1 blade for mulching, side discharge and using the grass catcher. The fall is the time to consider repairing your lawn and getting it ready for winter. You can give your lawn a head start by doing a few simple things. Fall lawn repair and care can give your lawn a head start next spring when the growing season starts. Within a month your lawn will look great and recover quickly from the wear and tear of the winter season. The main steps for making your lawn look great and also keeping it healthy easy to follow. First remove all debris from the lawn. this includes leaves, twigs, weeds and anything that blocks the sun from your grass. Although leaves with all of their colors may look great, they can damage your lawn. Mold will form on and under the leaf. Air and sunlight does not penetrate to the lawn. In short your lawn can die out in that area. It is not a pleasant task to rake up moldy wet leaves. 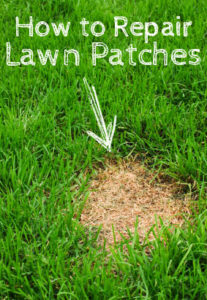 Another step to follow is to make repairs to areas of your lawn that need repair like the one in the picture. First use a rake to remove the dead grass and thatch. Add good quality soil to fill in the depression. Apply appropriate grass seed for your area and lightly cover up the grass seed with more soil. Water every day to facilitate the new seed to germinate and begin to grow. Remember you need to do this in early fall to ensure that your seed has time to germinate and put down roots. Finally fall fertilizer should be applied to help your grass build a strong root base and prepare itself for the winter. Remove the leaves as mentioned above. Keep cutting, but to the correct height. Loosen the soil using aerating machines. Add fertilizer for the fall. Stay on schedule, don’t leave it too late before the snow arrives or the grass stops growing. This is our second post about types of fertilizers. Our previous post discussed organic fertilizers. This post will cover soluble synthetic fertilizers, slow release fertilizer‘s and water insoluble nitrogen. Many consumers select the type of fertilizer they wish to use based on local climate, the type of grass they have and the environmental conditions e.g. spring, summer, fall, humid, arid etc. It is very important to match your grass type with the desired look and feel of your lawn when making a decision regarding what type of fertilizer to use. The big advantage of this type of fertilizer is predictability. You can learn the exact effect they have on the lawn. This is an important feature for many lawns. Soluble synthetic fertilizers become available to the lawn before the soil has thoroughly warmed in the summer, they are less expensive than organic fertilizers, and they are easy to handle. Apply less fertilizer. The percentage of nitrogen is usually higher. More applications are necessary because the effects are short term. If your lawn requires 4 to 6 pounds of actual nitrogen a year, then many separate applications are necessary. Because of the high percentage of nitrogen, there is the possibility of fertilizer burn. To avoid this, apply the fertilizer at the recommended rate. Spread it on a dry lawn, and water it thoroughly after application. Exceptions are some weed and feed products. They are formulated with soluble fertilizer‘s. They are designed for use on wet grass during moderate temperatures, usually under 85°F. To some extent these fertilizers combine the characteristics of the organics and the soluble synthetics. Usually they have a high percentage of nitrogen, spreading large quantities is not necessary. Nitrogen does not become available to the plant all at once. Many lawn growers favor slow release fertilizers. They make heavier applications of nitrogen possible. However, they do not provide a quick green up. Your control of greening response is slightly more than with organics. Our next post on lawn fertilizers will cover water insoluble nitrogen, complete fertilizers, and fertilizer and pesticide combinations. For more posts about lawn care and how to have a great looking lawn that is the envy of your neighbors, click here. 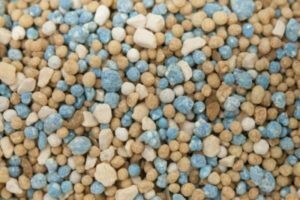 This post and the next two posts following this one discuss more detail about the types of fertilizers for your lawn available on the market for consumers. A little shopping in a garden store reveals an abundance of lawn fertilizers. You see labels proclaiming fast acting, slow release, and so on. But if they all contain the same basic minerals, what is the difference? Here is a description of these products. Organic fertilizers: a chemist might argue that some manufactured fertilizers are technically organic. Here organic refers to a fertilizer derive from plant or animal waist. The variety of organic fertilizers is endless. There are manures of all kinds, sewage sludge, blood meals, and seed meals. They all share in advantages and disadvantage. In some areas, they may be inexpensive and easy to obtain, yet the reverse is often true. Most have distinctly beneficial soil building properties,. Since the action of organic’s is slow, over fertilizing is usually not a problem. This is the major difference between organic fertilizers and soluble synthetic fertilizers, their nutrients are released slowly. Organic fertilizers are bulkier, heavier, and more difficult to handle than other types of fertilizer. They have a low percentage of nitrogen, so it is necessary to apply a much greater quantity at one time. They may also have an unpleasant smell. The release of nutrients from organic fertilizers depends on the weather and is, therefore, unpredictable. Soil microbes must digest the organic material to release its nutrients. Because the activity of micros depends on soil temperature, nutrients may not be available in early spring or in late fall when cool season grasses are growing actively, but be abundant in summer when cool season grass should not be fertilized heavily. Our next post will talk about soluble synthetic fertilizers, slow release fertilizer‘s, water insoluble nitrogen, complete fertilizers, and fertilizer and pesticide combinations. For more posts about lawn care, fertilizers and much more, click here. People accept the fact that they must mow and water to maintain the health of their life. But some may question the need for fertilizer. They should not. Fertilize Your Lawn. Lawn grasses live in an unnatural environment. The grass plants are crowded together. They compete with each other, along with neighboring trees and shrubs, for water and nutrients. They are mowed regularly, which is highly irregular in nature. Their clippings, a source of nutrients are often removed. Because of this competition and the unnatural demands placed on lawns, they must be fertilized. Just as a balanced diet works best for people and animals, the same is true for lawns. They need fertilizer for sustenance. When properly fertilized, the lawn maintains good color, density, and vigor. It does not easily succumb to insects, weeds, or diseases. When under fertilized, the lawn is less attractive. It also is considerably more susceptible to environmental stress and damage. 16 different mineral elements are essential to the growth of all awns. Some are common, such as oxygen from air and hydrogen from water. Others, such as zinc or boron, are needed in only the minisculet amounts usually found naturally in most soils. Nitrogen: this is by far the most important element the lawn needs. It promotes rapid shoot growth and givesl awns a healthy color. Nitrogen is the mineral most often in short supply. 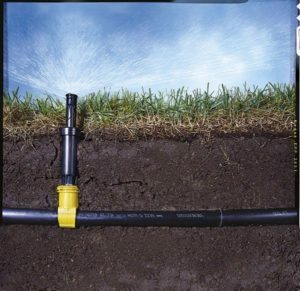 Growing lawns need a plentiful and continuous supply of water, but watering also flushes nitrogen from the soil. Without sufficient nitrogen, growth stops and the lawn becomes pale and yellowish. On the other hand, if there’s too much nitrogen, thatch and disease develop. new lawns need it at such a high percentage. It is not readily flushed from the soil by watering and is needed by established lawns in small quantities, so most balanced lawn fertilizer‘s contain only a low percentage. Phosphorus is supplied by phosphoric acid. Next to nitrogen, potassium is second in importance. And like nitrogen it is flushed out of my water but at a slower rate. It strengthens lawn grasses, enabling them to withstand traffic and resist disease. Potassium is needed in about the same quantity as nitrogen, but since the soil supplies a considerable amount, not as much is added to fertilizers. The major source of potassium and fertilizers is potash. Calcium, sulfur, and magnesium: it takes relatively large amounts of these nutrients to meet the needs of most lawns. Calcium is either present in adequate quantities in the soil or is added through periodic applications of lime. Dolomite supplies magnesium as well as calcium. Most soil sulfur reaches a lawn through the air, water or organic material. Micro nutrients: these are elements needed in small amounts. If your lawn does not become greener with an application of nitrogen, the problem may be a shortage of iron. This is particularly true in your areas were soil pH is high. Yellowing can also be caused from a sulfur deficiency, or watering, Manganese is deficiency of sandy soil‘s, or a pH less than 5.0. A soil test may be needed to help find the cause of persistent soil related problems such as these. For more posts about lawn care, click here. Power lawn mowing equipment is so common that it is taken for granted. But power mowers are responsible for thousands of accidents yearly. Follow the guidelines below about lawnmower safety and mowing tips, along with those provided by the mower manufacture, and you can avoid becoming another injury statistic. An injury from a power lawn mower can be very painful and disabling for the rest of your life. Always follow safety rules when working on or operating a lawn mower. It could be your fingers, toes or even a hand that you lose if not careful. Do not disconnect the manufacturers safety features and always keep in mind the possible dangers. Many fingers have been lost by unclogging discharge shoes of rotary lawn mowers. Make a habit of turning off the power and disconnecting the spark plug before reaching into the clogged grass. Use common sense when mowing steep or uneven terrain. Check the stability of the mowere first, and be aware that a slipping lawn mower can injure both you and your lawn. Mow slight slope‘s either across or up and down. If there is a chance of slippage, tie a rope to the mower and more down the slope from the top. Perhaps the safest way to handle a slope is to plant ground cover that does not need to be mowed. Walk over the lawn area before mowing, looking for rocks, toys, sprinkler heads, and other possible obstruction’s. Do not allow children to use a power lawn mower until they are strong enough and mature enough to handle the job. Don’t cut wet grass. It causes uneven mowing, the clippings are messy, and they can matt and block light from getting to the grass. There’s also the danger of slipping on wet slopes. Pick up stones and sticks before mowing. Alternate mowing patterns. Mowing the same direction every time tends to compact the soil and causes wear patterns. If you are using a reel mower, give the lawn an attractive checkered finish my mowing it twice, traveling in opposite directions. Check the blade height by measuring the grass after cutting. Sharp turns with a mower can cause uneven cutting. Make wide turns or take advantage of sidewalks and driveways, but be aware of rocks or debree on pavement areas. If the ground is uneven in some areas because the soil is settled, be careful not to scalpe the high spots. For more lawn mower safety suggestions, click here. There are a variety of types of lawn mowers for consumers to choose from. They have various applications and may be of interest to home owners with specific needs for maintaining their lawns. Electric nylon lawn mowers cut grass with nearly the same efficiency as steel bladed lawnmowers and are much safer. Two counter rotating disk powered by separate electric motors spin mono filament line to mow and trim your lawn. Several other less common types of mowers are available for special jobs. Flail mower‘s, also known as hammer knife mowers use T-shaped blades revolving on a horizontal shaft to cut grass. They are useful in maintaining rough areas such as vacant lots and on the sides of highways. Sickle bar mowers are perfect for an empty lot overgrown with weeds. They are the same sort of more that farmers use to cut fields of oats and other hay fields. Heavy real mower are useful for the one or two times you need to cut the lawn extra low for Thatch removal. Many consumers will rent this type of lawn mower from a local small tool rental store instead of investing in this type when it is only used once or twice a year. High wheel rotary mower cut higher than most rotary mowers, about 4 inches, and are easy to maneuver over rough terrain. If you just want to keep the weeds at bay and are not concerned about having a manicured look to the lawn, this type of mower is very useful. Again, if you only use it once in awhile, renting can be an option. For more details about types of lawn mowers to purchase, click here. Reel mowers her available in manual models or powered with gasoline or electric engines. They cut with a scissor action, which produces the cleanest cut. Reel lawn mowers conform better to lawn contours than rotary lawnmowers, but are impractical on rough uneven ground or for tall growing grass. They can also be difficult to push when the ground is rough or if the grass is long. Owners should cut the grass often to avoid more difficult mowing situations. Because they can be adjusted to cut quite low, they are the preferred lawn mower for bent grass or Bermuda grass lawns. In general, reel mowers are preferred for fine lines but perform poorly on tall grasses and lawns with high, wiry seed heads. Power reel lawn mowers discharge clippings from either the rear or the front. The rear throw type is widely available and less expensive. Front throw reel lawn mowers are used primarily by professional landscape gardeners. They are usually well-made and can stay in constant use. The weight and power of these lawnmowers makes them perfect for the lawn mowing requirement of Bermuda grass or Zoysiagrass lawns. Height is easy to adjust, usually with just a lever. Some can be adjusted low enough to cut at the soil line. For more information about buying a lawn mower, click here. Power rotary lawn mowers are the most popular by far. It is generally lower priced, more versatile, and easier to handle and maintain than a reel type lawn mower. It stands rougher use. 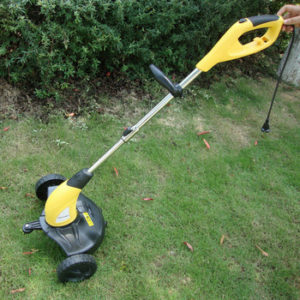 It’s blades cut like a spinning scythe , which is better for taller growing, less intensively maintain lawns. The blades are also easier to sharpen. However, power rotary lawn mowers require great caution in use. They need larger motors with more horsepower; they do not cut as cleanly as a properly sharpen reel lawn mower; and few can mow lower than 1 inch. The lawn mower also shakes if blades get out of balance. The type that rides on a cushion of air, rather than on wheels, is the easiest to use if your lawn is smooth and level. It is almost friction less and can be swept sideways as well as forward and backward. However, it does not hover properly on rough ground, and it’s tendency to skim downhill makes it difficult to use on sloping lines. You probably need a riding lawn mower if your lawn is large. Riding lawnmowers come in Rotary and reel models, but rotaries are the most common types available. Although they are fun for adults to drive, they are not toys; do not let children playing with them. Almost every home owner with a lawn as a lawn mower. The number of available varieties and styles grows each year. It pays to shop around until you find the mower that meets your specifications. There are many lawn mower types, but really only two major lawn mower types. The two most common mowers are the reel and the rotary. Each basic type has its variations for example gas or electric power, walking or riding, pushing or self-propelled. Some have bagging attachments or grass catchers. While these are similar features look them over carefully to determine how they operate and are used. Consumers will want to make sure they are convenient and easy to use in their circumstances. Before buying a lawnmower, look it over carefully. Consider it’s maneuverability. Make sure the grass catcher is easy to take on and off. Ask about the safety features. These points will help you choose the right lawn mower type for your personal situation. Lawnmowers can be specialized. Some are designed to cut weeds, others are engineered to produce the carpet like nap you have on a putting green. There are some unusual types, too, such as the one that rides on a cushion of air and the one that cuts with a spinning mono-filament line. Our next post will discuss the attributes of rotary lawnmowers. After that we will talk about reel type lawn mowers and other types. Whether to leave clippings on the lawn or to pick them up is a question of many gardeners. There are advantages and disadvantages to leave in grass clippings on your lawn, depending on the type of grass you have and how well you maintain it. Leaving clippings of cool season grasses on the lawn does not cause or contribute to thatch buildup. It is the woody, slow to do decompose stems below warm season grass blades that contributed most to thatch build up. Clippings return nutrients to the lawn. 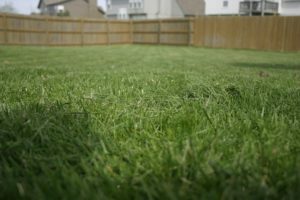 Although it is difficult to measure, some estimates suggest that as much is 1/3 of the nitrogen requirement of a lawn can be supplied by decaying grass clippings. At certain times, however, it makes sense to remove clippings from your lawn. First of all, clippings can be unsightly. They are removed from any intensely maintain lawns for just this reason. Secondly, if you do not mow your lawn frequently enough you will cut off too much grass at one time. If clippings mat down and block the sun from the lawn remove them so only a light cover of clippings remain. Some people remove clippings to use as a composter mulch in a vegetable garden. This is fine provided their free of two, 4D another broad leaf herbicide. Continually mulching tomatoes with herbicide treated clippings for example, has resulted in distorted plants. Also, watch the weeds in the clippings, they can create havoc in your garden. To remove clippings from your lawn, use a steel tine lawn rake after mowing. The tines are made of spring steel and snap back into position even when bent back. Do not substitute a steel wire leaf rake for collecting clippings. It’s wire tines are more likely to tear the grass. An easier solution is to purchase a grass catcher bag for your lawn mower. 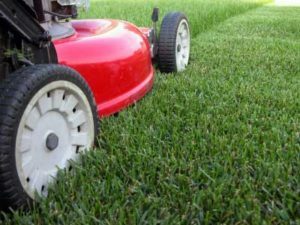 Newly seeded lawns are more delicate than established ones, which is why you have to be more careful when you mow a new lawn. The soil is soft and the grass plants usually are not deeply rooted by the first mowing . On the other hand, when you mow a new lawn, especially those planted vegetatively, it helps the plants to spread, thus promoting a thicker lawn. Use common sense and apply the same principles for properly mowing any lawn. If you are experiencing a hot dry spell, make sure that the new lawn is receiving lots of water. The top layer where the roots are trying to establish themselves will dry out very quickly. Your lawn may perish before it even gets started. You may need to water the lawn every day. For the first time after it has grown a third higher than the regular mowing height. For example, a lawn that should be maintained at a 2 inch height should be mowed when it reaches two and a half to 3 inches. Do not remove more than a third of the total height of the grass. If you can, use a mower that is not too heavy, especially if the soil is too soft. A lightweight rotary or push real mower is your best bet when you mow a new lawn. Make sure the mower blades are sharp; young grass plants can be easily pulled from the soil by dull blades. If the soil remains too soft or if the new grass is too loosely knit to mow without damage, wait. Let the lawn continue to grow, then lower the cut gradually until it’s down to the proper height. reduce the cutting height by 1/2 inch or 3/4 of an inch every second mowing until you reach the recommended mowing height. Mow your lawn at the right height for a healthy lawn. 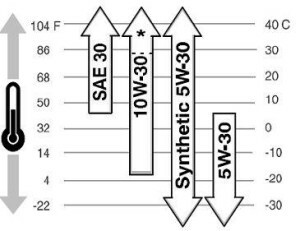 Proper mowing height depends primarily on the type of grass. The rule of thumb is: mow the grass when it grows from 1/4 to 1/3 taller then it’s recommended mowing height. For example, if the recommended mowing height for your lawn is 2 inches, mow when is about 3 inches high. The penalty for not paying attention to the recommended height is a stiff one. By letting grass grow too high and then cutting away half or more at once, you are expose stems that have been shaded and may burn in strong sunlight. If the lawn is yellowish after you mow, you have waited too long. More importantly, roots are severely shocked by heavy mowing and may need several weeks to recover. Research has shown a direct relationship between the height of the cut and the depth of roots. When grass is properly mowed to it’s recommended height, roots grow deeper. Intern, a deep root system makes lawn care much much easier. Grasses tend to spread either horizontally or vertically. For instance, Bent grass and Bermuda grass spread horizontally by creeping stems. Because the stems are parallel to the ground as well as the cut of the mower, they are not normally mowed off. Unless these grasses or mowed low preferably with a heavy real mower, they will have problems with thatch. Think of it this way: X amount of leaf surface is necessary to keep the grass plants healthy and growing. If that Leaf surface spreads out over a wide area, the lawn can be mowed close to the ground without reducing the necessary leaf surface. 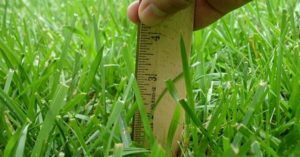 Vertically growing grasses, such as by bahai grass, common Kentucky bluegrass, tall fescue, and Saint Augustine grass, cannot be mowed too low, below 1 1/2 2 inches, because they do not have enough leaf surface to support the plants. Mowing to low probably ruins more Kentucky bluegrass lawns more than any other practice. This is especially true in transitional periods were adaptation is marginal. Cut high, Kentucky bluegrass is more disease resistant and can successfully complete with weeds and insects. The tall growth shades the soil, keeping the temperature lower for cool loving roots. Exceptions are some of the new Kentucky bluegrass cultivars which are essentially dwarfs. They are more compact and have more leaf surface in less area. In shade mow another 1/2 inch higher.